Are you looking for a durable and yet stunning floor? Consider our impressive stock of ceramic tile. It comes in a wide variety of patterns and styles to fit your home design. With our expansive selection of ceramic tile flooring, we make it easy to outfit your whole house. You won’t have to wait to start on your next home improvement project. Our friendly staff is ready to assist you in picking out the perfect set. 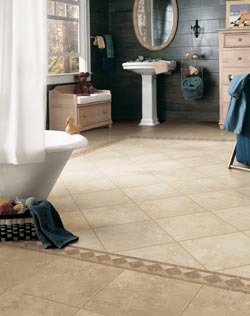 No matter if you’re installing a new ceramic tile floor in your kitchen, bathroom, or other room, we have you covered. After you decided on the right tile flooring for your home, you want it to last for years to come. We only carry the top brands in the industry. Our team is dedicated to making your money go further. You’ll discover great deals on outstanding ceramic tile flooring. Every pick is sure to stay smooth and stunning over the years. We even offer ceramic tile flooring installation to ensure top results each and every time. Make your home really shine by starting your next flooring project at our showroom. Whether you’re looking to sell or just want to enjoy the great benefits of a new floor, we have amazing tile options for you. All of our flooring retains their value throughout the seasons. You won’t have to worry about your new floor degrading or needing replacement anytime soon. Our ceramic tile flooring is a wonderful investment that is sure to pay dividends right away. Your family and guests will instantly notice the new flooring. Improve your home with new tile by shopping at our showroom today. With so many great ceramic tile options at our flooring store, it may be hard to settle on just one set for your project. When this happens, turn to our friendly staff. We provide personalized service to ensure that you’re completely satisfied with every purchase. You are sure to fall in love with your new ceramic tile floor when you shop with us. We start by listening to all of your questions and concerns. While browsing our expansive selection, our staff is more than ready to help discuss the particular benefits of any set. With us by your side every step of the way, it’s easy to make the most out of your new ceramic tile floor. As part of our full-service approach, we also offer ceramic tile flooring installation from experienced specialists. Our team takes time to perfectly align each and every piece, giving you a stunning surface. There won’t be any chipped or cracked sections after we finish up. Our professional installers also work quickly and efficiently to minimize any disruption to your day. Rest assured that your new floor is in great hands. Simplify your life and rely on us for installation of your new ceramic tile floor. Contact our friendly staff to learn more about our expansive selection of ceramic tile flooring. We proudly serve clients throughout Sturtevant, Mt. Pleasant, Racine, Somers, and Union Grove, Wisconsin, as well as the surrounding areas.